A beautiful old high street on a hill, surrounded by green – the market town of Lewes makes me feel instantly at home. The town is buzzing with excitement as the Olympic torch is about to pass through. There’s about 16,000 residents, most of them on the street today. The largest employer here is the public sector. I notice a good number of chain stores, but quite a few independents holding their ground. Juliet meets me in Café Nero – the only coffee place she could think of off the top of her head with WiFi which I needed for some urgent internet access. We then went on to the lovely local organic Pleasant Bakery for lunch. But things like this – which include the thorny topic of opening hours – make me wonder if independents need or want help to see the importance of understanding customers’ needs, and meeting them at least as well as the chains (I know a lot of independents do offer free WiFi and open late). To fight off a Costa Coffee attack in Totnes, a whole campaign has emerged to protect the local cafes, starting with a local coffee competition that improved the quality of coffee in town, something needed to help stage a strong defence. (Update: this campaign just lost the battle, but hopefully not the war!). 1. Identify and where necessary ‘pump prime’ enterprises that can contribute to a low-impact, low carbon local economy. 2. Provide support for young and start-up enterprises in whatever aspects they find challenging – informed by an Enterprise Survey. 3. Locate skills and resources across the community – for example by establishing an Enterprise Resource Bank to enable skills and resources to be easily located and shared across Lewes. For the Pump Priming, there’s a fledgling draughtproofing enterprise (based on the Belsize Park /Brixton model). The approach here was to present this as an idea for a new enterprise, and offer training. A number of people applied, and someone was selected to take this forward. Given that passion and sense of ownership are key to successful enterprises, I think it’s interesting to see how this approach works out – the idea that a Transition town can identify specific enterprise opportunities, and then recruit someone to take them on. I wonder if this idea can become that recruit’s own passion, and if they can have a full sense of ownership, independence and commitment to its success, or if it remains the responsibility somehow of the Transition town. Another model of course is that people come forward with their own ideas, based on their own passions and interests, and then the Transition town offers some support and encouragement. It’s great to see places experimenting with different approaches, maybe we need a mix of both. The Lewes Pound was an early project for TTL, and the connection to a local business, Harvey’s Brewery, has been important. Today around 15,000 Lewes pounds are in circulation, accepted by approximately 150 traders in the town. Plenty of initiatives are in motion to encourage further uptake, including a recently finished pilot cashback scheme where, typically, shoppers receive back 2 Lewes Pounds for every 20 spent. The Lewes Food Market is a spin out of TTL. 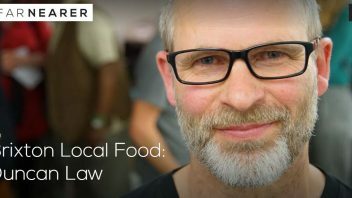 It is run by Lewes Local Community Interest Company (CIC), established in 2010 with the broad aims of developing sustainable local food systems and making it easier for Lewes people to buy high-quality, seasonal food directly from local producers each week. 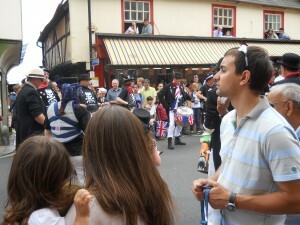 It complements the thriving monthly Lewes Farmers Market. The Ouse Valley Energy Services Company (OVESCO) was one of the earliest Transition energy companies to get started, and can boast the UK’s first ever community owned solar power station, on the roof of Harvey’s Brewery depot. They also installed PV on a school and have a large but secret project at an early stage. The Better Banking Group (first one of these I’ve come across) was set up to explore how to give local people an alternative to the big banks. Having discounted the possibility of setting up a community bank from scratch (at least for now), the Group is strongly involved in promoting the East Sussex Credit Union, as well as educating and raising awareness about the banking system. Colin Tingle of the Lewes & Ouse Valley Eco-nomics group (L&OVE) is part of TTL and especially interested in valuing natural capital and eco system services – see the relevant REconomy section or this BBC article for more info. John mentioned Brighton Community Agriculture which is up and running, currently providing lamb through its sheepshare project. The range of skills in the group is extraordinary, and much has been achieved by TTL but resource issues were again a big topic of conversation. How can the significant amount of effort that is involved, if the group’s dreams are to be realised, be resourced? How can people get compensated for leading and enabling an economic transition of the scale that’s required? One interesting thing I note is that we are seeing some enterprises emerging that are supporting Transition activity, and that offer fee-based services. For example, Martin has set up a coaching/training/facilitation social enterprise called Decision Lab that aims to help Transition places and groups in particular to work well together. Nick Osborne from Glastonbury has Response-ability that also does work around group skills, and offers training to Transition groups. I’m sure there are plenty of others out there. My own work is in this sphere too, I am paid to work on the REconomy Project thanks to funding. I created the project proposals and funding bids, and it pays me and other team members though on a part-time basis (which suits us all). But the big question I think is how can someone(s) be paid to lead and co-ordinate this work for the Transition initiative? This is a hot topic for Totnes, and we (our group of 8 local strategic organisations that are taking responsibility for helping our new economy emerge) have identified our top priority is to fundraise for a 3 year full time post. Is this a replicable model for every TI? That remains to be seen. If all of us working in this space can show a good story of Transition driving tangible economic shift, then possibly this will help support the case for similar funding elsewhere. 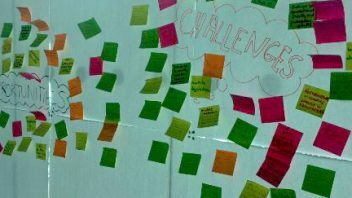 Will local people and businesses help resource TTLs work? Questions remain about where this money can come from in a world where traditional sources of funding for economic development are drying up. 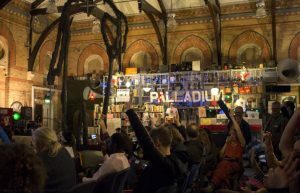 At the same time there are opportunities to explore other means, including community based funding models – if the community is benefitting from the economic stimulation, how might they help resource this work? For example, if we have 3,000 local businesses in a town (like in Totnes district), and we can demonstrate the value we bring them, then £10 each per year would pay a full-time person, near enough. Main image: my visit with the TTL Enterprise Group plus Brighton visitors. May I suggest we launch with a nationwide ambition the CTE (Community of Transition Enterprise) as a serious competitor to the FSB (Federation of Small Business). I’m sure we could make this value at £10.00 a month, not £10.00 per year. The FSB from launch had 25 000 members inside nine months & was growing at 200 new members per day. Currently their membership is about 2 000 000. A rough calculation would indicate their income to be in excess of £25 000 000 per annum. It’s true members rallied round a national insurance issue at the start, but Transition has a far more compelling justification for a new representative organisation. As a member of the FSB I don’t believe it represents my concerns & I know numerous other members who question it’s value. I believe we could put together a much more attractive membership package, & in a way that the FSB could not respond. Even if they did it would have to be by adopting a Transition agenda, which in itself would be a success. I don’t believe however, as an organisation that they truly understand the issues. Far better that we start something new & fresh. I could leave it at that, but this is my bigger picture that I look forward to exploring on REconomy Day in September. 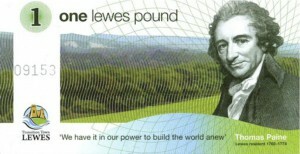 I want to start a local currency like Lewes, but I want to address predominantly the money supply side of it by funding it from a local charity initiative. Local donations will be in exchange for a credit denoting a stakeholder interest in the town. The local currency will be fed into circulation via donations to organisations in the charity sector who need to make local purchases. Meanwhile the plan is to invest the principal in community assets, predominantly renewable energy projects designed to produce a ‘return on investment’ for those supporting the charity. I then plan to open a charity shop from where I want to coordinate a community newsletter. We will pay for donations in local currency that then has to be spent with local businesses. We will pay the printer in local currency, & the sign writer for the shop etc. The newsletter will be not for profit, which means we can offer local businesses inexpensive advertising that they can pay for with local currency taken through their till. This could be a major membership benefit of the CTE. We only need to save them £10 on their monthly advertising spend to pay for their membership with just one benefit. A similar newsletter produced by every community would carry the Transition message far & wide. Oh dear, oh deary me…. far far far too complicated. I’ve a headache just assimilating that. I’d be surprised if anyone else responds to your post. Hopefully this may spark some interest. Can I guess you’re an ideas man. You are not in a position of power, a decision maker or doer; you’ve spent your life harbouring ideas or trying different projects. I suggest that’s all that will ever happen – unless you change your modus operandi. Don’t get me wrong – your ideas are fantastic – but so are all ideas until they get implemented. 1. Don’t upset the existing apple cart – if something works leave it alone. U don’t like the FSB, yet you are still a member and so are 2m other people – it would be fairly easy 4 them to adopt a transition type arm thereby usurping your model. 2. Concentrate on ONE aspect of an idea. I like the newsletter one to start with. Simple, understandable, historically workable with a built in existing transition following. Complicated, interlinked plans give people a reason to say no and at the very least to think about it. 3. Feed your concepts surreptitiously to the people that can act on them! Make them feel it was their idea – you’ll see stuff happening much quicker. Everything starts as an idea. Thanks for the encouragement. Just for the record, the charity is up & running & has donated over £1000 to local good causes, thus far in sterling. The newsletter, also once an idea, is on issue 6. Our website, with the potential to morph in to something appropriate for the idea also exists, with about 120 pages of community information, including a business director for which businesses are already paying £120 per annum. I’m very happy to redirect that income stream to REconomy to kick start the proposed TCE. I have nothing against the FSB, except that it was born out of a different time when profit was the only mantra of business. There is a new kind of socially aware enterprise these days that needs a whole different kind of representation, some of which will run contrary to that which the FSB might promote. I have earmarked an appropriate shop for the charity & have been shown round by the commercially letting agent. I’m very focused on all of this now, but previously build a window cleaning business to 10 operatives with 6000+ clients. That involved a few decisions. If power was a concept that interested me, I suppose I’ve had some of that also. As far as the idea being complicated, it is in fact very simple, & very holistic. It’s the fact that each part complements the others that gives it mileage. Having said all of that I accept that it’s a big challenge & may well never happen. If it does however, it will only be with encouragement & support, which thankfully is already forthcoming, mostly. Get your own ideas not Earl Nightingale’s. Anyway, I disagree with him, – everything starts with observation. But, well done Mr Carter. I hope you don’t think I was having a go at you…so no requirement to feel the need to justify yourself. A quick google search and matching of evidence indicates you are referring to http://www.acommunity.co.uk? If that’s your website – I like it. But that’s not the issue. I only commented regarding your mish-mash of interlinked ideas on this post. If you still think your concepts are understandable by the man on the Clapham Omnibus then therein perhaps lies the problem. If you wish to have any chance of implementing them quickly and successfully the suggestion is to re-read my 1st post again. PS: Having just glanced thru some articles on the aforementioned website, you seem to have adopted a more focused, unequivocal and balanced style of presenting your ideas….maybe this is not your website after all? Wow… can anyone else see the huge irony here? Devilsadvocate you have some valid points about good communication but it’s really difficult to pick them out from behind your annoying tone. I hope you continue to comment and spread your thoughts on here but for you message to land your communication skills have to be considered. Wow and Wowzer. Can anybody see the even bigger huger larger exceedingly great irony. You’ve clearly picked out what I’ve had to say and discovered my annoying tone – yet my valid points seemed to have landed on your small runway. Perhaps it is you who should revisit your condescending communication skills. Maybe this post has now communicated the interest it deserves. BTW, please don’t take any of my comments to heart – the clues in my name. Has any progress been made in regards to the newsletter? I am only just reading this thread now, but I’m hoping this did happen. Hi there, we’re getting closer to a newsletter but haven’t started one yet. In the mean time we write a small piece each month for the Transition Network news letter and for the Transition culture monthly round up.